Special Theme: Civil Conflicts in Africa (Part II). Le processus de rétablissement et de maintien de la paix en Angola; A.B. Beye. State Collapse and Prospects for Political Reconstruction and Democratic Governance in Somalia; A. Yannis. Civil Conflict in the Great Lakes Region: The Issue of Nationality of the Banyarwanda in the Democratic Republic of the Congo; A.N. Makombo. The Rwandan Conflict and the Genocide Convention: Implications for Tanzania; K. Kamanga. Le forum prorogatum devant la Cour internationale de Justice: les ressources d’une institution ou la face cachée du consensualisme; M. Bedjaoui, F. Ouguergouz. À propos de l’ordonnance du 15 mars 1996: la contribution de la Cour internationale de Justice au maintien de la paix et de la sécurité en Afrique; J.-P. Cot. The 1996 Zambian Constitution and the Search for a Durable Democratic Constitutional Order in Africa; M. Ndulo. The Process of Democratization in South Africa and the Protection of Human Rights under the New South African Constitution; M. Sinjela. Constitutionnalisme et légalité internationale; F. Rigaux. Recourse to the Law in the Settlement of International Disputes: Western Sahara; B.G. Ramcharan. 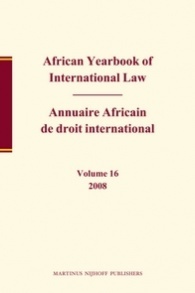 The International Tribunal for the Law of the Sea: Its Role for the Settlement of Law of the Sea Disputes; T. Mensah. The Forty-Ninth Session of the United Nations International Law Commission; J.L. Kateka. East African Co-operation: An Analysis of Recent Developments; W.T.K. Kaahwa. Vers l’institution d’une Cour africaine des droits de l’homme et des peuples; M. Mubiala. The United Nations and Internal Conflicts in Africa: A Documentary Survey; M. Sinjela.